Swiss watch exports maintained a stable outlook in the first four months of 2015 based on data released by the Federation of the Swiss Watch Industry. The total export value was 1.8 billion francs (-0.8% compared to April 2014). Precious metal watches, particularly gold, showed a decline, clearly dragging down the overall result. On the plus side, bimetallic timepieces made the strongest positive contribution, while steel stagnated. Volumes showed a more pleasing trend, thanks mainly to steel and the category of other metals. Growth was concentrated in the segment of watches costing less than 200 francs (export price) where the number of timepieces increased by 7.9%. Between 200 and 3,000 francs, downturns were in the order of -7%. Timepieces costing more than 3,000 francs were not a driving force in April and their value was down slightly. While there were few declines on main markets, those in evidence were significant. The decline in exports in Hong Kong seems to be aligned with the reality of local sales. The United States continued the positive trend just like China that recorded particularly strong growth, albeit somehow distorted by temporary exports. Japan registered a decline, though less steep than on other markets. An unfavourable base effect due to an excellent 2014 is a key factor in this result. In Europe, Italy, France and United Kingdom recorded strong growth. Swiss watch exports: January-April 2015 trend. Swiss watch exports maintained a stable outlook in the first four months of 2015 based on data released by the Federation of the Swiss Watch Industry. Swiss watch exports: 12 months moving average. 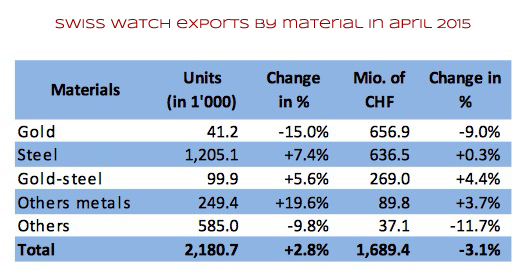 Swiss watches exports by material in April 2015.